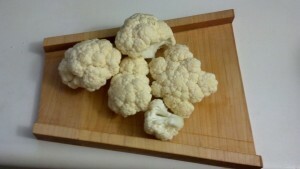 Make your “Cauliflower Flour” by grated a head of cauliflower as fine as possible. (A food processor works great!) Put in microwave safe bowl, cover with plastic, and cook on high for 7 minutes. Let cool, then soak up excess liquid with with a tea cloth or paper towel. 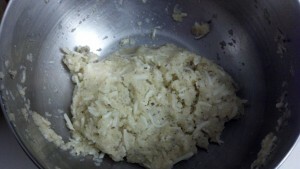 Add egg, seasonings, and 1/4 cup Mozzerella cheese to the cauliflower flour. Stir until the mixture forms a ball. Then transfer to greased pizza tray. (I like to use olive oil spray!) Cook at 450 Degrees for 12-15 min. 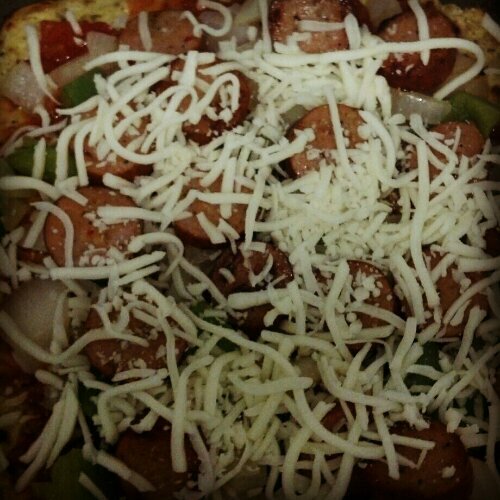 While Pizza crust is cooking prepare toppings. 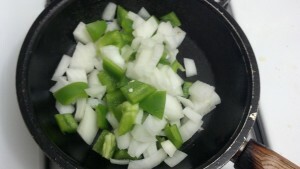 Sautee veggies and cook meat, because they won’t have time to fully cook. 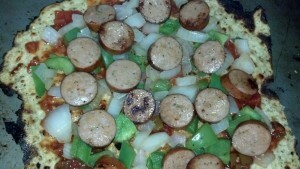 1/2 Pizza (with sausage, cheese, peppers, and onions)= 395 Calories, 18g Fat, 9g Carbs, 4.4g Fiber, and 37g Protein!